There is a widely-recognized community need to enhance crisis services across the city and district of Thunder Bay. There is currently no place in the city and district, with the exception of Emergency Departments, for a person in crisis to walk-in to, come back to or be taken to. Several service providers in the city and district of Thunder Bay have reported several informal walk-ins for people in need of crisis support. 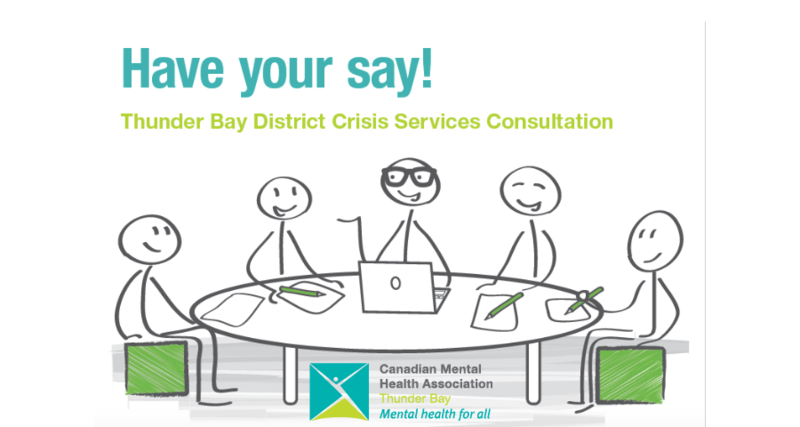 In response to this community need, and in alignment with a service system priority for a community-based Crisis Centre as identified by the Thunder Bay Mental Health and Addictions Network, CMHA Thunder Bay is leading a consultative process this fall to encourage discussion about the concept of a Thunder Bay and District Crisis Centre. The expansion of crisis services and the implementation of a crisis centre will build upon CMHA’s existing crisis infrastructure and the momentum of the recently launched, Joint-Mobile Crisis Response (JMCR) Project. The following have been identified as Key Principles/Pillars of the Crisis Centre: Across the lifespan, 24/7 (After Hours) access, and no threshold. The centre would include enhanced crisis/safe bed capacity. CMHA Thunder Bay is engaging community partners, clients and families to discuss the expansion of their crisis services and importantly, the concept of a crisis centre for the Thunder Bay District. CMHA Thunder Bay hopes to gather enough feedback to inform the development and submission of a Health System Improvement Pre-Proposal to the North West LHIN.